Marines with 3rd Battalion, 6th Marines, returned late last week to Camp Lejeune, N.C., after their difficult seven-month deployment to the former Taliban stronghold of Marjah. 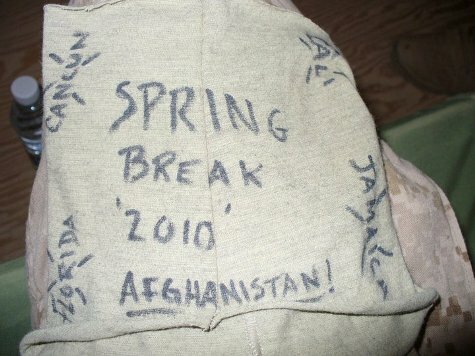 I’ve kept in touch with quite a few of the battalion’s Marines since my embedded assignment with them ended in May, and thought it’d be fun to share this photograph of a sweatband that one of them wore regularly downrange. Marine humor at its finest, I’d say. My son, HM3 Tyler Burdick, who you met while with 3/6 India, was in an MRAP struck by an IED about 6 days short of rotation. He left theater a few days early via Dwyer, Bagram, and Landstuhl, and is wrapping up a month at NNMC Bethesda. He was fortunate, with severe injuries, but only below both knees. He is hoping for discharge to outpatient in a few days, so he can hunt down a big Dodge pickup and check out handicap facilities in all the pubs between D.C. and Lejeune, and then between Lejeune and Salt Lake City. He says hello, Dan. Hey Dan, thanks again for all the wonderful articles you wrote while embedded with 3/6 and especially India Company. I just got back from the homecoming at Çamp LeJeune and I can’t tell you how wonderful it was to see my son Tommy and all the marines. They are true heroes in every sense of the word! Dwight, sorry to hear about Doc, and thanks for telling me. I had no idea. I’m glad to hear he has plans laid out for for the next few months. That road trip should be great. Cathy, it was my pleasure. I’ll likely be heading back out again at some point, either late this year or in 2011.